Look at the “background color,” rather than the “foreground” red color. If the background is yellow instead of green, the peach or nectarine will be a good one. Many people judge ripeness by amount of red instead of by the background color, which can lead them to choose unripe fruit. 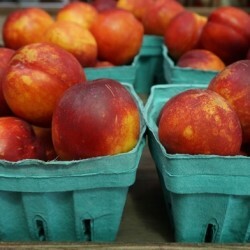 Keep stone fruit on the counter, rather than in the fridge, if you want them to ripen faster. 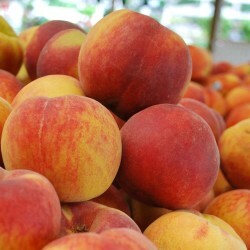 Pick these stone fruits gently, using the length of your fingers rather than getting a close grip with your fingertips. Settle peaches and nectarines into your picking basket very gently. Once ripened, peaches and nectarines are softer than most fruit, so they need some extra care while you are picking them. Cardboard boxes make the best containers for stone fruit. Bags and deep buckets do not make good picking containers because the peaches and nectarines on the bottom will get bruised. You can bring your own boxes or purchase them at the pick-your-own stand.